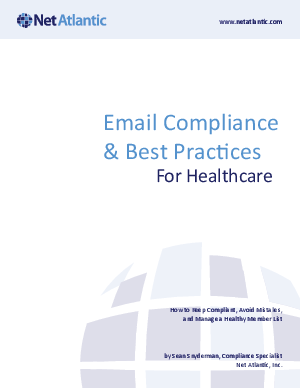 Net Atlantic's whitepaper, "Email Compliance & Best Practices for Healthcare" helps healthcare providers and healthcare product and service vendors understand email communications compliance issues. It illustrates how CAN-SPAM forms the foundation of compliance, and also explains why healthcare organizations have to go beyond CAN-SPAM to sustain a truly effective email communications strategy. Healthcare users of email for communications should know how to use these best practices before building their email campaigns.